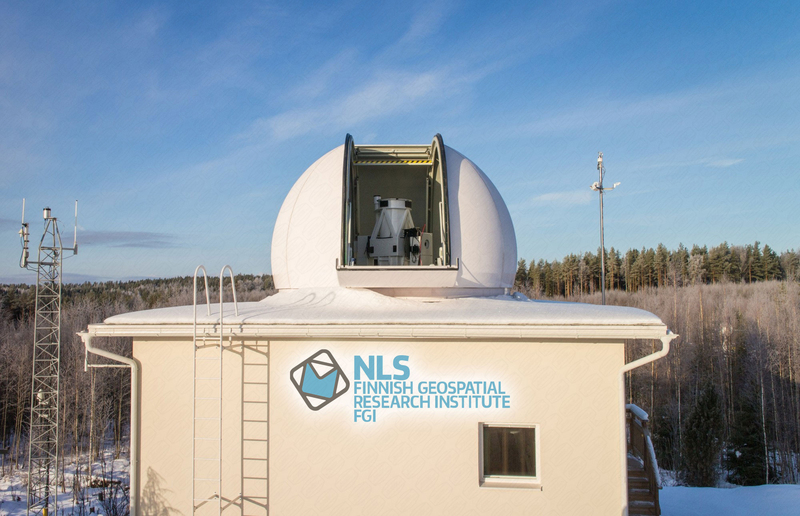 Finnish Geospatial Research Institute (FGI, formerly known as the Finnish Geodetic Institute) of the National Land Survey of Finland is operating a geodetic research station at Metsähovi, Kirkkonummi, Finland (60.2N, 24.4E). Metsähovi is one of a few geodetic core sites worldwide where all major space-geodetic measurement systems, including satellite laser ranging, are co-located. Satellite laser ranging (SLR) is a measurement technique where ultra-short laser pulses are transmitted through a telescope that is tracking a satellite equipped with retroreflecting mirrors and then subsequently received back at a receiver attached to the telescope. With precise measurement of the time of flight of the laser pulse, several important geodetic parameters can be obtained including: variations in Earth's gravity field, location of the center of the mass of the Earth, and scale of the terrestrial reference frame. SLR is also used in validation of orbits of several types of satellites including navigation and remote sensing satellites. The dome needs to be able to operate in all weather conditions where SLR operations can be performed. This includes operating during daytime, when the dome is used as a sun-shield for the telescope. It needs to be tightly sealed while closed to allow fast resumption of operations after the weather improves. We talked to several manufacturers of observatory domes and also to other SLR observatories about their experiences with different manufacturers. It soon became clear that Baader Planetarium GmbH produces the domes best suited for our requirements. We selected from Baader's products a 5.3-meter fiberglass reinforced polyester observatory dome (up and over shutter -type) with geared tooth drive. The dome was built and installed in 2014. In addition to the dome itself, we also ordered, e.g., an integrated weather station working together with a dehumidier system. Before describing our experiences with the Baader dome, it is important to summarize the operating environment of the dome at Metsähovi as the dome's main purpose is to protect the telescope against the environment. Metsähovi is located in the southern Finland approximately 20 km from the sea, at an altitude of 60 m above the sea level, in a rural environment. The weather conditions at Metsähovi show characteristics of both maritime and continental climate: summer is humid and relatively warm and winter is cold. The temperature normally varies annually between -25° to +30° Celsius, with a yearly average temperature around 6° Celsius. Seasonal snow normally covers the station from December to April and yearly precipitation is around 700 mm with approximately 170 days with rain. Supercooled water rain can occur during late autumn and each summer Metsähovi receives a few hailstorms, mainly together with thunderstorms. The mean relative humidity for an average year in Metsähovi is ~80%. Fog arising from the nearby small bog and from the Baltic Sea is relatively frequent during cold summer mornings as well as during the sea-ice forming and melting season. The station sees a few storms each year with gust wind speeds up to 25 m/s, but mostly winds are around 0-10 m/s. Dust and pollen from the surrounding pine forest, especially during spring, has the tendency to cover all surfaces.